Most tribute recordings or projects labor under several burdens. The musicians who made the original recordings are, in most cases, no longer alive and playing . . . .although one could make the case that Louis playing POTATO HEAD BLUES thirty years after its issue, Ellington revisiting IN THE SHADE OF THE OLD APPLE TREE, Billie singing WHAT A LITTLE MOONLIGHT CAN DO in 1952 . . . are all paying tributes to their earlier selves. But, in general, artists who choose to “play old records live” in the studio or in concert have the towering presence of those accessible sounds to deal with. Some tribute projects attempt to impose a modernist sensibility on established repertoire and style . . . with results that require equal parts love, understanding, and daring to pull off — STRANGE FRUIT remixed over techno rhythms wins points for novelty, but to me it feels blasphemous. For a number of sessions, he assembled a series of dream orchestras, featuring saxophonists Steve Wilson, Donny McCaslin, Scott Robinson; brass players Greg Gisbert, Laurie Frink, Ryan Keberle, Marshall Gilkes, rhythm section players James Chirillo, Joe Locke, Frank Kimbrough, Jay Anderson, Lewis Nash; singers Kate McGarry, Wendy Gilles, Luciana Souza, and many other brilliant musicians. Initially I was intrigued by the project because I so admired the Evans arrangements for Claude Thornhill and the work he did for Miles Davis, most memorably MILES AHEAD and PORGY AND BESS. The Evans sound I cherish suggests floating clouds, many-hued, that are ever-changing,never static, leaving impressionistic traces as they move across our consciousness. About the Evans who organized lengthy electric-flavored orations devoted to Jimi Hendrix compositions, I know little. But once the disc arrived, I was initially delighted by the perceptive diligence Truesdell showed in the research that got him and his orchestras to perform these otherwise “unheard” works. Some might say that his efforts are no different from a conductor faced with a score of a “new” work, but Truesdell has managed to balance the pull of individualism — assembling an orchestra of mature soloists and section players who can create appropriately within an idiom without offering pastiches of others’ solos — and staying faithful to what is written in the score. I knew I had to write this post when there were certain tracks on the CD –THE MAIDS OF CADIZ, HOW ABOUT YOU, DANCING ON A GREAT BIG RAINBOW, BARBARA SONG, and — most memorably, WHO’LL BUY MY VIOLETS? — that I wanted to play over and over. I had been hesitant at first — did I know Evans well enough to appreciate this music? Would I find it too outre for my well-nourished narrowness? I need not have worried: the music’s beauty broke through any imagined walls. This CD honors Evans’ essential spiritual brilliance without getting confined within an idea of “repertory” that is ultimately imprisoning. I found much to love in this music . . . and I will keep and replay this disc into the future. For more information about the project, the CD, and future appearances by Truesdell and his master musicians, click here. Many pleasures await! This entry was posted in "Thanks A Million", Bliss!, Jazz Titans, Pay Attention!, The Heroes Among Us, The Real Thing, The Things We Love, Wow! and tagged arrangements, Billie Holiday, Donny McCaslin, Duke Ellington, Frank Kimbrough, Frank O'Connor, Gil Evans, Greg Gisbert, James Chirillo, Jay Anderson, Jazz Lives, JimiHendrix, Joe Loocke, Kate McGarry, LaurieFrink, Lewis Nash, Louis Armstrong, Luciana Souza, Marshall Gilkes, Michael Steinman, Miles Davis, repertory, Ryan Keberle, Ryan Truesdell, Scott Robinson, Steve Wilson, Sylvia Townsend Warner, tributeprojects, W.B. Yeats, Wendy Gilles, William Maxwell. Bookmark the permalink. 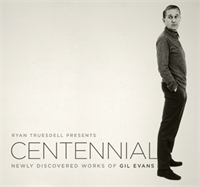 Thanks for posting this info about Ryan Truesdell’s Gil Evans Project. It is obvious from the listing of the names of the musicians who participated in this project that the orchestra assembled by Mr. Truesdell was first-rate. I am absolutely delighted to learn of this band and this recording. I can’t wait to get the CD and enjoy more of the artistry of Gil Evans. Evans’s music, like the music of all other giants of jazz, deserves to be played by real, live musicians before real, live audiences. I also very much appreciate the arrangements Gil wrote for Claude Thornhill, including: “Arab Dance,” “Sorta Kinda,” “Twilight on the Trail,” “La Paloma Gris,” “The Troubador” (“Pictures at an Exhibition”), “Anthropology,” “Lover Man,” “Robbins’ Nest,” “Donna Lee,” “Polka Dots and Moonbeams,” and “Yadrbird Suite.” The charts he did for Miles Davis’s Nonet, and then later for Miles’s Columbia albums “Miles Ahead,” “Porgy and Bess,” (as you so astutely pointed out Michael), and the equally wonderful “Sketches of Spain” to me are landmarks of American music. Listening to these arrangements today, 50 and more years after they were written, I continue to be struck by Evans’s startling individuality, and his rich musicality. There are two very good biographies of Gil Evans. “Gil Evans…Out of the Cool,” by Stephanie Stein Crease, which was published in 2002 by A Cappella Books, and “Castles Made of Sound…the Story of Gil Evans,” by Larry Hickock, also published in 2002, by Da Capo Press.